It is often required to involve complex processes to produce materials with special properties. At a plant for processing metal powders, Titanium based super alloys were previously atomized in a vacuum melting process to be further processed, packaged and homogenized. The plant of Graf Anlagenbau GmbH, a manufacturer of super alloys makes use of this process which comprises several steps: Transfer station, material bin, screening, packaging and handling system. The entire system is flooded with an inert gas (Argon) to prevent that the handled material is damaged by the exposure to oxygen. The first step of the process is the material exchange from the vacuum melting furnace to the material bin using an Argon atmosphere which is constantly monitored. The material bins are custom designed to assure an uninterrupted Argon atmosphere during handling and storage. The material bins consist of an asymmetrical exit hopper to improve product flow and to assure discharge of the bin. The bins can be rotated on a special mixing device to keep the product homogenic. 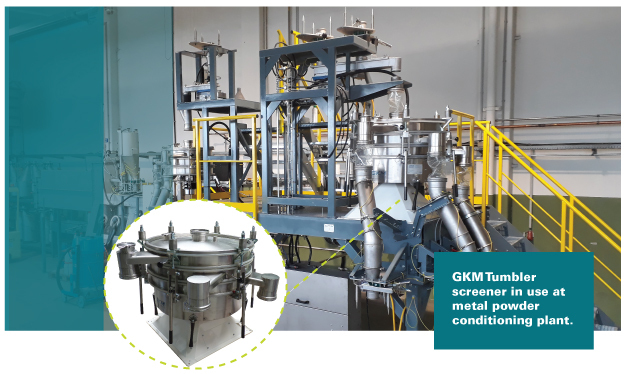 The Tumbler Screener of GMK Siebtechnik GmbH is the heart of the system. It is a special design to perfectly match the process requirements of screening metal powders without oxygen contaminations. The material bins are docked to the top of the screening system from where the powder is transported by fully sealed vibratory channel and fed to the Tumbler Screener. The material is separated into three different particle sizes to remove unwanted oversized particles. The Argon supply can be fully automated if required. The Tumbler Screener is equipped with an ultrasonic cleaning option to assure that particles down to 25µm are screened efficiently. The bins coming from the Tumbler Screener are being docked to a scale and the vibratory channel. The material is being filled into plastic containers for use by the customer after the screening process. The fill station is located inside a glove box still under Argon atmosphere to not expose the material to oxygen until sealed. The filled plastic containers are being moved by a pneumatic elevator and roller tray. The calibrated scale is incorporating a protocol log to recall batch data if required. The close collaboration of GMK Siebetechnik GmbH and Graf Anlagenbau GmbH made it possible that the project was successfully completed within a short lead time of only four months from initial design concepts to commissioning.